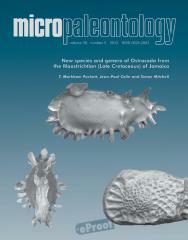 ABSTRACT: This paper describes twenty-five new species and three new genera of marine ostracodes from the Late Cretaceous (Maastrichtian) deposits of Jamaica. The new species include Amphicytherura grandicribra, Amphicytherura occulta, Asciocythere cabbagehillensis, Aysegulina chapeltonensis, Aysegulina riominhoensis, Aysegulina sagitta, Aysegulina ventrocurva, rachycythere jamaicaensis, Buntonia nana, Buntonia vulgaris, Cytherelloidea guineacornensis, Eocytheropteron hazeli, Eocytheropteron jamaicaensis, Eucytherura mitchelli, Floricythereis exquisita (new genus and species), Hemiparacytheridea exquisita, Leiocythereis polita (new genus and species), Loxoconcha pindarsensis, Ovocytheridea rotunda, Phrixocythere unionensis (new genus and species), Pterygocythereis babinoti, Schizoptocythere pinna, Schizoptocythere nana, Schuleridea exiguus, and Spinicytheridea compta (new genus and species). One of the new genera, Floricythereis, together with Schizoptocythere, is considered to include previously-described species from North America, indicating a faunal link during the Late Cretaceous. The description of the Late Cretaceous faunas of Jamaica is a step in understanding the relationship between biological evolution and plate tectonics in the Caribbean region during the Late Cretaceous.